To be perfectly frank, I am no fan of Margaret Mead. Had she been born a while later, she probably would have been the Senior Social Scientist at the Human Terrain System. I once heard a colleague describe her, in supposedly positive terms, as one of anthropology’s “war horses” –which seems all too true on many different, unflattering, levels. I use some of her work in my visual anthropology course, but generally I have avoided her work, not recommending it to students, and her work had absolutely no impact whatsoever on either my entering or staying in anthropology. So, hopefully I have made myself clear: I don’t like her, at all, in no way. This post was “inspired” by a random event: I have been rereading some early interviews with the founder of Haystack, Austin Heap, in preparation for the next Encircling Empire report (which will come out sooner than planned, because it is huge already). Incidentally, I basically have the same opinion of Heap as I do of Mead, except that she actually did real work, and didn’t just gain the public spotlight for work not achieved. Where else have you encountered references to Margaret Mead in popular culture? I would be curious to know. Wonder though if Heap didn’t mangle Mead’s quote as much by removing it from its original context which came from the 1966 publication The Wagon and the Star, which Mead co-wrote with Muriel Brown. An rather odd “study of American community initiative” that makes some very strident claims on the basis of rather thin evidence, nevertheless Mead was writing about American grass root community politics and engagement. 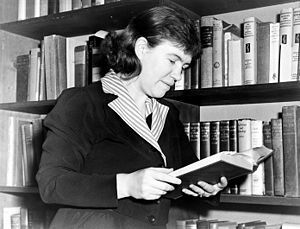 I think the Discovery Institute, via the Catholic Register, shares your contempt for Margaret Mead – but not for the same reasons. It should be read for its comedy value alone. I found a reference to Margaret Mead in Mad Men. I’m not sure whether that qualifies as popular culture or not. Excellent! Thanks for those references, and just a note to say that I mentioned to Jamil that you had posted a question on another topic, so he might respond either tonight or tomorrow. nicely done, Max. I don’t know if you’ve read Eric Wakin’s “Anthropology Goes To War,” but if I remember correctly there’s a reference to her spitting (!!) on one of the anti-war anthropologists connected with the Committee of Concerned Asian Scholars. Possible I’m mangling much of this, but worth a check. Yes, that’s right Erik. She did do that, angry at critics (!) like Wolf and Jorgensen, and very eager to shut down the AAA investigation into anthropological involvement with counterinsurgency, which she then whitewashed. She seems to have had no problem with her beloved “Papa Frans” remaining censured by the AAA for all those decades. To top it off…her vision of visual anthropology is akin to using a microscope or surveillance camera, some of the basest positivism one can find in writing. In the “Beautiful Girls” chapter of Mad Men, one of the main characters (Peggy) stares at the boys in the office fighting with the vending machine and says: “I feel like Margaret Mead”. I am not partial to Mead myself but I was glad to see her mentioned anyways. Thanks very much Daniela. If I can find the episode online, I will probably extract the scene and upload it, adding it below what I have here. Who knows, after a while, we may have enough scenes to mount an informal video collage of Mead references in popular culture, which would be interesting. Thanks again CM and Daniela…I found the episode and am currently processing it to get that scene extracted, so it should appear above in another video segment later tonight. Not sure that it qualifies as popular culture, but Rebecca Solnit references Mead’s The Wagon and the Stars in her last book, A Paradise Built in Hell – rather fulsomely which kinda surprised me as you’d figure her more of a David Graeber reader than Mead. It’s great to see all these references, many thanks Bernice and cafeconflores! Can Bernice tell us what page the supposed Mead quote appears on in “The Wagon and the Star?” I can’t find it. Hopefully Bernice will reply, because I don’t have the book myself and have never read it. As for Heap’s interview with the BBC, that is dated Thursday, 6 August 2009. Bernice will not reply, because she can not supply us with a line or a page for this quote. This quote does not come from Mead and Brown’s book The Wagon and the Star. I defy anyone to find a published source referencing the source of this quote that has repeatedly and falsely attributed to Mead after her death. Mead never wrote these words, they were invented by her apostles after they claimed she ascended into the Heavens. Very interesting. It might be that Bernice is just not checking these messages, but in any case I am intrigued enough to have my university’s other library send a copy to our downtown campus so I can check it myself. Are you absolutely certain that Mead never said or wrote these words, that the saying was attributed to her falsely? That’s amazing if so. Follow up: a colleague asked a Mead expert for the location of the original quote and the reply was that “no one knows when or where she said this,” which gives some further weight to what you say here. Apparently, she gave him one of his best grades while he was there, a B+, but I guess she was also a notoriously easy grader. George W. Bush took an anthropology class? And with Margaret Mead? Yes, “we” really do enlighten, elevate, and transform the minds of our ethnocentric and bigoted citizens, don’t we. Many thanks for that link. Apparently someone thought they had something to learn about photography from Margaret Mead–which is amazing, because the camera in her hand was something akin to a microscope for examining dead tissue, and she had the logic to go with it.